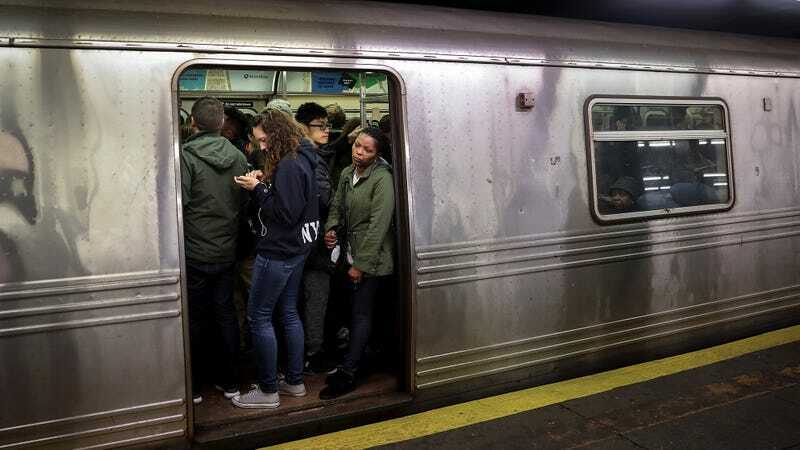 NEW YORK—Clarifying that none of their trains feature intercom systems, the Metropolitan Transportation Authority revealed Monday they have no clue where the disembodied voice speaking to everyone on the subway was originating. “The MTA has never at any point hired a speaker to tell passengers ‘Stand clear of the closing doors’ or ‘We are delayed because of train traffic ahead,’ so we urge anyone who hears one of these disturbing notices to contact us immediately,” said acting chairman Fernando Ferrer, adding that the individual reportedly likes to repeat these phrases tens of thousands of times a day and is, thus, clearly unstable and probably dangerous. “Our aim has, of course, always been to give riders a silent experience, so the fact that a mysterious woman is apparently shouting the names of each station, telling people to beware the platform edge, and listing all available transfers is deeply, deeply troubling to us. There’s not a single transit car the violators have missed, so we’re encouraging all New Yorkers to be especially vigilant until we apprehend these obviously unhinged people.” Ferrer added that commuters should disregard any and all posted advertisements, which have never been allowed in New York City subway cars.